Reports of animal and fish die off's are mostly reported in local newspapers or websites so the problem is often missed by the greater public, however, since around 2011 the problem has become global thanks to certain websites dedicated to reporting the phenomenon, literally millions of species are dying every day and the cause of many of the deaths are unknown. 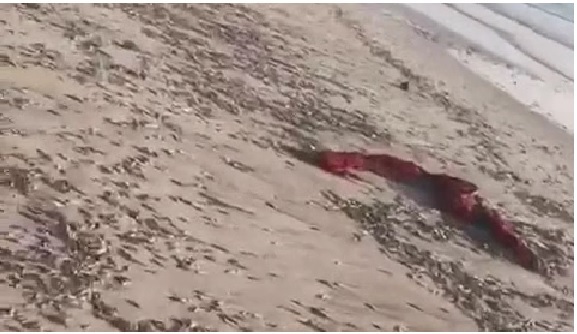 Residents of Al Rams area in Ras Al Khaimah woke up on Monday morning to an astonishing sight: a large stretch of the beach was littered with thousands of dead fish. The small Sardines lined a large part of the 1.6km shoreline. The cause of the mass death was unknown, and the Ras Al Khaimah Environment agency said they are investigating possible causes. Dr Saif Al Ghais, executive director of the Ras Al Khaimah Environmental Protection and Development Authority EPDA-RAK , said the department met in the evening at around 6 pm to discuss the incident and identify its cause. The department formed a team of investigators and reviewed the results of water sample analysis by the Environmental Protection and Development in addition to dead sardine sample analysis. Dr Al Ghais pointed out that the department had received complaints from the residents of the area on Monday morning as the stench of the dead fish was keeping people away. Dr Al Ghais said the preliminary results of the investigation suggested that fishermen may have overloaded their vehicles, causing some of their catch to fall.